COLD SPRING SHOPS. : HELPING THE ENGINEER CONTROL THE SPEED OF THE TRAIN. Observations on economics, the academy, the wider world, and things that run on rails. HELPING THE ENGINEER CONTROL THE SPEED OF THE TRAIN. David Foster of Chicago Boyz picked up my coverage of the possible railroad shutdown account no positive train control by year's end, as Congress wishes. He expressed the hope that I might explain why this is so difficult, and one of his readers wondered if something couldn't be purchased off the shelf from Germany or some other place that runs really fast trains. The short answer is that monitoring the speed, separation, and performance of trains on a railroad network is a tougher engineering challenge than either the Manhattan Project or a moon shot. Outrageous enough for you? Stay with me. The Manhattan Project demonstrated that a critical mass of radioactive material could be brought together in such a way as either to produce a controlled chain reaction or an explosion. Project Apollo demonstrated that a launch vehicle could be built capable of carrying sufficient payload to land a manned spacecraft on the Moon with sufficient life support for the crew and fuel to permit a takeoff from the Moon and a transearth injection. Positive Train Control is the latest attempt to solve a much older problem, namely preventing two trains from occupying the same piece of track at the same time, as well as a corollary problem, allowing as many trains as practicable to occupy different parts of the track. 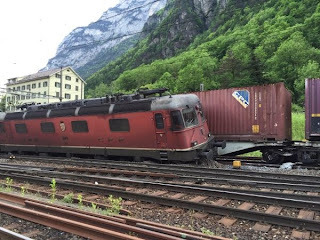 When two trains attempt to occupy the same piece of track, bad things happen. It's relatively simple to keep only a few trains separated. Issue a timetable. Note, in railroading, that a timetable does not REQUIRE a train to be at a station at the specified time. Rather, it means that the train will not be BEYOND that station BEFORE that time. This is the section of Time Table No. 54 of the Boston and Maine Railroad, effective at 12.01 A. M. on April 27, 1952, governing the movement of trains on the Portsmouth Branch. Under the instructions, inward trains are superior to outward trains. 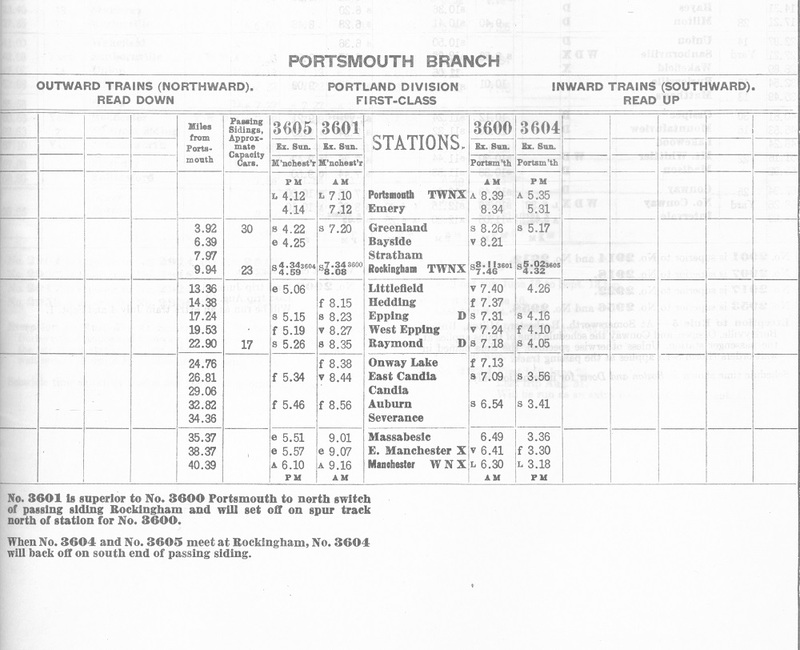 Thus an outward train is obligated to clear the time of an inward train, unless the fine print (3600 superior to 3601, Portsmouth to Rockingham) stipulates otherwise. An inward train has right to the railroad for up to twelve hours. As long as everything runs according to schedule, nothing breaks down, no snowdrifts or leaves on the track or a broken-down one-hoss-shay at the road crossing, that's all that's required to keep trains from running into each other. But if the superior train breaks down, absent some other means of control the inferior train has a long, avoidable wait. And the trains on the schedule are passenger trains, doesn't the navy base require a delivery of fuel, and don't the New Hampshire farmers want their milk picked up? Thus, you have to have provision for running the freight trains. Not much of a problem, simply issue train orders authorizing an extra train. The passenger trains don't have to know about the freight extra, because the freight's crew have timetables, and conductor and engineer know where the passenger trains will not yet be, and plan their movements accordingly. And unless advised otherwise, the crew of the passenger train will be protecting against extras in the event of an emergency. St. Erth for St. Ives in the summer of 2007. The signalman, whose 'box is the brick-and-siding structure in centre background, will soon raise the angled signal blade to horizontal, which any of you who have seen Thomas the Tank Engine knows means "Danger" and in the British rules means STOP. DO NOT PASS. There are serious consequences for the train driver who commits a "Signal Passed at Danger." We're still dealing with a labor-intensive way of spacing trains, and it's still subject to human error. The signalman can fail to observe the passage of a train, or to re-set the signal, or the driver (there, engineer here) can run past the signal. It's also up to the engineer to control the speed of the train in order to make a safe stop before passing the signal. 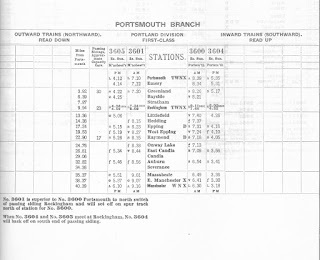 Thus railroads replaced the dispatcher and station agents and tower operators with a train director capable of controlling long sections of track from a central office. Hence, centralized traffic control -- in North America, the train director often takes the traditional title of dispatcher. On the Burlington Racetrack, those signals are responding to directions issued by a dispatcher in Fort Worth. That distant train is on the left-most (north) track, and the signals are properly showing red, advising any train heading away from me on the north track to STOP. IMMEDIATELY. The dispatcher's control station in Fort Worth, perhaps assisted by computers, will prevent him from clearing that signal in the case he has a lapse of attention. The signals governing the center and right tracks display a clear signal, meaning at least two blocks in advance of an approaching train are clear. Note: at least two blocks clear, that's a potential hazard the designer of positive train control has to address. Note also: blocks are fixed section of track, if there is a train in the third block, is it just past the signal at the entrance to the block, or further along? The designer of positive train control has to keep track of the exact position of all parts of the train at all times. Note finally: the train approaching the green signal might be a mile-long unit oil train running at 40 mph that you don't want to make a quick stop with, or it might be a suburban train running at 60 mph that can be stopped relatively quickly, or it might be a container train also running at 60 mph, but with very different handling characteristics. The designer of a positive train control system thus cannot design a one-brake-application-fits-all-conditions for the trains on the network. Railroads have grappled with both the stopping distance and the signal-passed-at-danger problems with a number of mechanical or electronic devices that backstop the inattentive engineer. We've had inattentive engineers, or napping engineers, long before smart 'phones became another impetus for enhancing safety appliances on the railroads. To stop a train at a red signal, the Chicago Transit Authority installed a tripper between the rails at the location of the signal. When the signal was red, the tripper popped up, and a train that didn't stop short of the tripper hit the tripper, which tripped a valve under the lead car, leading to an emergency brake application, a quick stop, spilled coffee, and flat wheels. For years, automatic train stop has been available as a more subtle way of keeping the rails safe whilst spilling less coffee. The engineer gets a warning and has a few seconds to make a service brake application, before the machinery takes over and spills the coffee and flattens the wheels. But, unlike what the designers of positive train control hope for, this device reinforces the obligation to stop short of entering the next block, it doesn't kick in whenever a train in motion is getting too close to another train in motion. Now put yourself in the seat of a train engineer who sees a yellow signal ahead. Comply with the rules, reduce speed, signal turns green ... do you thus increase speed? Pass the green, next signal is yellow, do you reduce speed again? Comply with the rules, reduce speed, signal turns green ... do you get lulled into expecting the yellow to change to green before you get there. And can you get away with it for days? weeks? months? until one day the leader is a little slow to get off the main track or breaks down and there you are, running the yellows until the yellow doesn't clear up and you now have less than the normal stopping distance to get your train under control, and it's just your luck that the leader broke down a short distance beyond that red signal you're coming up on pretty fast. With positive train control, the designer is effectively establishing a moving bubble of protection, always large enough to provide that safe stopping distance. But that's a significant advance over existing train control systems, which (as is true with the European Train Control System and Germany's Linienzugbeeinflussung) divide the railway into blocks. Those methods are more subtle than, for example, Chicago and North Western's Automatic Train Control, which advised the engineer either that there wasn't a train close by, or that a train was close enough to warrant a speed restriction. Timetable authority to leave Nürnberg just past noon. Casey Jones would understand that. Dispatcher will know what section the train is in. Bedwell and Dellinger wrote about that. Engineer will know approximately how much clear track is ahead. But only slightly more precisely than the engineer of the Kate Shelley departing DeKalb for Clinton did. Signals, centralized traffic control, automatic train stop, automatic train control, all permit more productive use and closer spacing of trains than a railroad could achieve using a timetable and a dispatcher issuing train orders to deal with unusual circumstances. And each method provides additional safeguards against human exhaustion or inattention. But no method yet permits simultaneous knowledge of the position, direction, and mass of all trains at all times. A working positive train control system must eliminate all three uncertainties. "Cold Spring Shops" was the name of the primary repair and car building facility of The Milwaukee Electric Railway and Light Company ... builders of trolley dining cars and the Christmas parade train ... perhaps I can be that creative too. PROFESSORS PRODUCE THEIR OWN CONTENT. IN PLACE OF "A AND B CIRCLE, X AND Y FLY." DENY COHERENT BELIEFS, ENJOY THE INCOHERENCE. ANDROIDS FIGHTING, BRAD AND JANET. JUST DON'T SET YOUR HAIR ON FIRE. DRÜCKEN SIE ZWEI FÜR DEUTSCH. THE HAZARDS OF FISHING OFF THE COMPANY PIER. DON'T BE AN IGNORANT JERK. WAITING FOR THE CANDIDATES' DEBATE. ADVICE TO THE MAN (OR WOMAN) OF SYSTEM. NEW ORLEANS IS WHAT DEMOCRATS DO. JUST IN TIME FOR OKTOBERFEST. SHUT UP ABOUT YOUR GOOD INTENTIONS. HARVESTING AN ECONOMY OF SCOPE. THE SHAPE OF THE FOURTH TURNING TO COME. CHASING THE PRODUCTIVE PEOPLE OUT. THE CONFEDERACY OF THE FRUSTRATED. AT THIS FOR THIRTEEN YEARS. THE WEAKEST LINK IN THE NETWORK? LIBERATE US FROM LIBERATING TOLERANCE.